At 93 years young this amazing man has had more life experiences than HBO could capture in one of their award-winning original dramas. A life that began gathering chicken eggs on a rural farm later thrust him into the "Roaring Twenties," the Great Depression, WWII, the Cold War, Watergate, the Vietnam War, and numerous recessions; this isn't some sort of brief history of the 20th century. For Grandpa Morton, this is his life. One might think that after nearly one hundred years on planet earth, a person would develop some sort of "been there, done that, I've seen all there is to see" sort of attitude towards living. But spend just a few minutes with this man and you'll feel humbled to be in the presence of such knowledge. He resonates optimism similar to the way our sun continuously exudes that life giving force we call energy. A day's worth of contact, and one feels as though she could write a self-help book based on the pearls of wisdom he regularly peppers into a conversation. When he speaks, I can't help but feel like I am a resident squirrel in a public park, waiting for this kind man to offer up another nut that I can cherish and protect, and eventually devour in effort to help me survive a bitter cold that lay ahead. During our recent visit, Grandpa Morton decided that he wanted to make us waffles for Sunday brunch. I marveled thinking about the countless waffles this man must have made throughout his lifetime. Surely he mastered his waffle technique many years ago, after a great deal of trial and error. I pictured him sitting at the breakfast table, a man growing older and the world around him rapidly changing, all the while the table setting and the waffle remaining constant. When Sunday morning arrived we all staggered from our respective beds, and grandpa made us waffles, one by one. As he hovered over the waffle iron for what seemed like an hour, a single waffle sat proudly on the counter next to him. 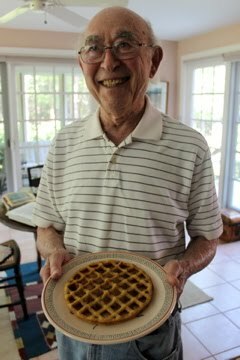 This was the day's first waffle, and it was to be grandpa's waffle, but he politely refused to eat it until the rest of us had been served. As time rolled by, the waffle began to lose its crispness, but grandpa didn't seem to care. It wasn't until it was his turn to eat that grandpa casually mentioned that this was the first waffle he had ever made by himself. Upon hearing this fact I went into a state of shock. Bewildered, I snapped the above photo in effort to try to capture the moment. Ninety-three years old and this man was still attaining new life experiences. "So, what did you think?" I asked. "It was alright," he replied. "Yes. It was okay. Perhaps I'll try making another one in ten years." The tone of his voice implied not the slightest bit of sarcasm or hesitation. On the contrary, the conviction of the comment assured me he will make that next waffle, even if it takes him another ten years to do so. Sharing in this moment made me feel as though I had stumbled upon a pot of gold. Perhaps it is his intention, his unwavering will to keep on going, that has guided grandpa and allowed him to live such a long and illustrious life. It wasn't just breakfast that grandpa bestowed upon us all this past Sunday. Once again, he effortlessly turned a routine exercise into a valuable lesson. No matter what kind of curve ball life throws our way, we mustn't hesitate to continue to dust ourselves off, adjust our grip, and step back up to the plate. Who knows what kind of delicious challenges tomorrow will bring? Greeting form NYC. Great blog. One more from NYC here. Will follow the blog.